Chewing gum is a popular activity for people of all ages. I remember becoming quite proficient at blowing very large bubbles at summer camp one year. 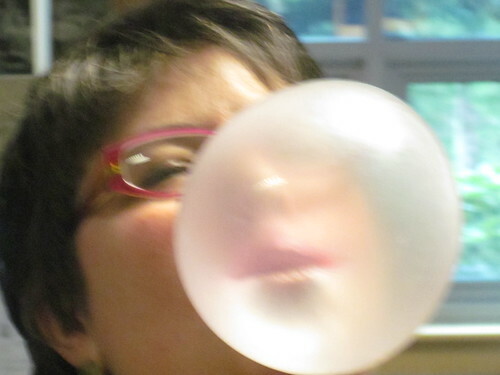 From then on, chewing bubble gum became a favorite childhood pastime of mine. Besides the bubble blowing, I got pretty good at peeling the gum off my face too! While chewing gum may be fun and a good way to kill time or stave off boredom, is it a healthy activity? It seems like some folks chew gum every single day. Are there any health issues to be aware of from too much chewing? Probably the number one reason to avoid most chewing gums is that they are loaded with chemical and synthetic ingredients. GMO corn syrup, artificial colors and flavors and chemical sweeteners along with many other unpronounceables are enough to cause any label reading parent to steer clear of these seemingly harmless treats. It is surprising how some caregivers who would never dream of giving a child a diet soda don’t think twice about doling out sugarless gum with similar neurotoxic sweeteners. Healthfood stores do offer some decent alternatives, but in my experience kids don’t seem much interested in them. They want the brands their friends chew that come in the the brightly colored packaging and have everlasting synthetic flavors that don’t diminish even after many minutes of chewing. To keep things simple, I’ve made the habit of simply not buying any gum. My kids do occasionally get a wad of gum at parties and whatnot, but since this is an exception, I try to look the other way and realize that this stuff can’t always be avoided. I do try to make sure they don’t chew it for long though! It is not well known that the amount of digestive enzymes your body can produce in a given lifetime is relatively finite. Chewing stimulates the secretion of digestive enzymes to prepare for food that never arrives in the stomach. Doesn’t it seem like a waste to use up your precious digestive enzyme reserve of these valuable, live proteins on the useless activity of chewing gum? If you chew gum frequently between meals, it is very feasible that you are using up your digestive enzyme reserves so that the next time you eat, you won’t have enough digestive enzymes on hand to fully digest the meal. It is conceivable then, that frequent gum chewing gum can provide the perfect backdrop for the development of digestive disorders over time. If you are already suffering from digestive complaints of any kind, gum chewing should definitely be avoided! Oral surgeons at UT Southwestern Medical Center in Dallas contend that too much gum chewing causes jaw stress. Dr. Sinn, a UT Southwestern oral surgeon, warns that jaw soreness, jaw “clicking” or pain in the jaw, head, or neck can be signs of TMJ syndrome and that gum chewing should be discontinued should such symptoms emerge. Given that gum chewing is commonly used to relieve stress, Dr. Sinn suggests other methods for reducing tension such as squeezing a ball, relaxation techniques or regular exercise to avoid the risk of chronic jaw problems. Probably the most important reason to abstain from chewing gum is that it releases mercury from dental amalgam fillings. A Swedish study found that people with silver fillings who chew gum for 5 hours or more each day had significantly higher levels of mercury in their blood and urine than those people with silver fillings who chewed gum infrequently. Mercury levels in the blood, urine, and breath at exhalation increased in proportion to the number of silver fillings each study participant had. Given that mercury is neurotoxic in any amounts in the body, it seems that chewing gum is an activity that should be undertaken with extreme caution if one has even a single silver filling. For pregnant women with silver fillings, chewing gum can prove toxic to the fetus should any mercury whatsoever be released into the bloodstream. Many pregnant women chew gum to help relieve heartburn or indigestion and yet the dangers of this activity if one has dental amalgams are not readily provided at prenatal visits even though mercury easily crosses the placenta. Can Chewing Gum Ever Be Helpful? I remember after one particular dental visit years ago, my jaw became painfully sore. The dentist had obviously overextended the jaw joint and the inflammation and pain was really excruciating for days on end. I tried to not talk much and eat only soft liquid foods to no avail. The joint just didn’t seem to get any better. Finally, I decided I would try to strengthen my jaw by chewing gum for brief periods of time and see if that helped to alleviate my discomfort. After about a week of chewing gum for short intervals each day, my joint pain began to dissipate and finally disappear altogether. Chewing gum might also be helpful after meals when additional enzymes are needed for digestion. Chewing gum for a few minutes after eating does seem to help some folks avoid indigestion, heartburn, or reflux. In some circumstances such as these, chewing gum can be therapeutic. In most cases, though, it should be avoided as an activity that really is not very health promoting.